UPDATED 9:11 P.M. EDT (APRIL 17, U.S.A.) Some Profitable Sunrise investors wired money to entities in Australia and Panama, according to new filings in the SEC’s pyramid-scheme and fraud case. The new filings, dated today, identify those entities as Technocash Limited of Sydney and Trackford Business Corp. of Panama City. Earlier filings named four other entities that the SEC says received funds from Profitable Sunrise investors: Melland Company SRO of the Czech Republic; Color Shock SRO of the Czech Republic; Solutions Company SRO of the Czech Republic; and Fortuna-K SRO of the Czech Republic. Melland, Color Shock, Solutions and Fortuna-K all have been named relief defendants. How the SEC intends to proceed against Technocash and Trackford was not immediately clear today. 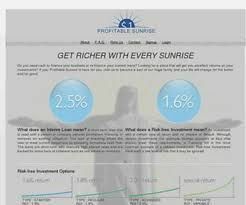 Various state regulators in the United States have said that Profitable Sunrise traded on Bible verse. Profitable Sunrise operated as Inter Reef LTD through a “mail drop” in England, and its director, Agnes Jouaneau, “is a resident of the Seychelles. She is director of several dozen other UK companies,” according to court filings. “Having heard from witnesses, examined documents, considered the legal precedents and the arguments of counsel, the Court finds that the SEC has established a prima facie case that Inter Reef violated Sections 5(a), 5(c), and 17(a) of the Securities Act of 1933 (‘Securities Act’) [15 U.S.C. §§ 77e(a), 77e(c), and 77q(a)], Section 10(b) of the Securities Exchange Act of 1934 (‘Exchange Act’) [15 U.S.C. § 78j(b)], and Exchange Act Rule 10b-5 [17 C.F.R. § 240.10b-5],” wrote U.S. District Judge Thomas W. Thrash Jr.
Thrash has approved a preliminary injunction and continued an asset freeze in the Profitable Sunrise case. A proceeding was held in open court today, according to the new filings. At that 20-minute proceeding, “no one” appeared for Profitable Sunrise or the relief defendants. Sold “securities” as defined under federal securities law . . .
A minute entry from today’s proceeding before Thash suggests that the SEC has deposed Profitable Sunrise pitchman Anthony M. Infante of Florida and that at least a portion of his deposition was read into the record today. Read SEC statement issued April 16. The ASD Updates Blog is maintaining an archive of Profitable Sunrise-related court filings. Tags: Agnes Jouaneau, Anthony M. Infante, Color Shock SRO, Fortuna-K SRO, Inter Reef LTD, Melland Company SRO, Profitable Sunrise, ProfitableSunrise, SEC, Solutions Company SRO, Technocash Limited, Trackford Business Corp., U.S. District Judge Thomas W. Thrash Jr.
Journeau is probably a figurehead president appointed by the incorporator in Seychelles. This was heavily discussed in the Planet Money episode where they setup their own shell corp in Belize. Those guys get VERY uncomfortable when you get too close to them. TechnoCash: Legitimate Payment Solution? Or Payment Facilitator for Scams? It asks the question, does TechnoCash knowingly act as a processor for SolidTrustPay, knowing that they are a ponzi-friendly payment processor. Are TechnoCash knowingly helping ponzi fraud schemes? Technocash is 110% legitimate….Though just like mastercard and numerous banks in the USA and other countries they have been used by scammers and in fact have been scammed themselves…. They could not be more legitimate if they wanted to….